Hello Baby! Welcome the new arrival with a shower of cuteness! 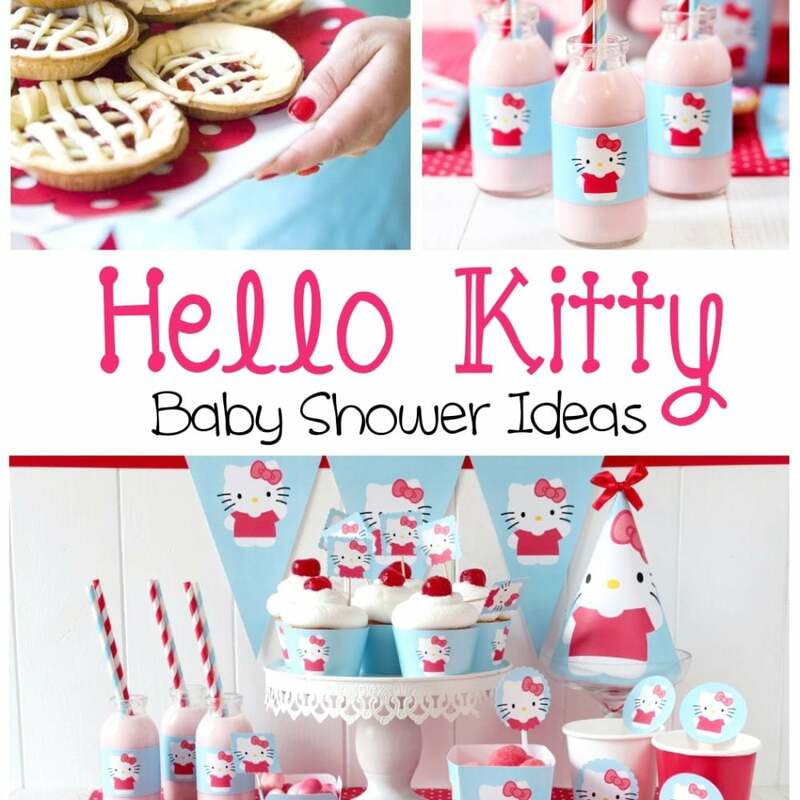 A Hello Kitty themed baby shower is a great theme idea for girls, since it’s based everyone’s favorite frosty feline, Kitty White, in case you didn’t know her real name! Like with every shower, you must start by making your guest list and sending out those invites! I’m a fan of custom invites for any themed shower, because they give your guests an idea of what to expect when shower day comes! It can also give your guests an idea for possible shower gifts ideas; i.e. Hello Kitty stuffed animal or baby clothes. 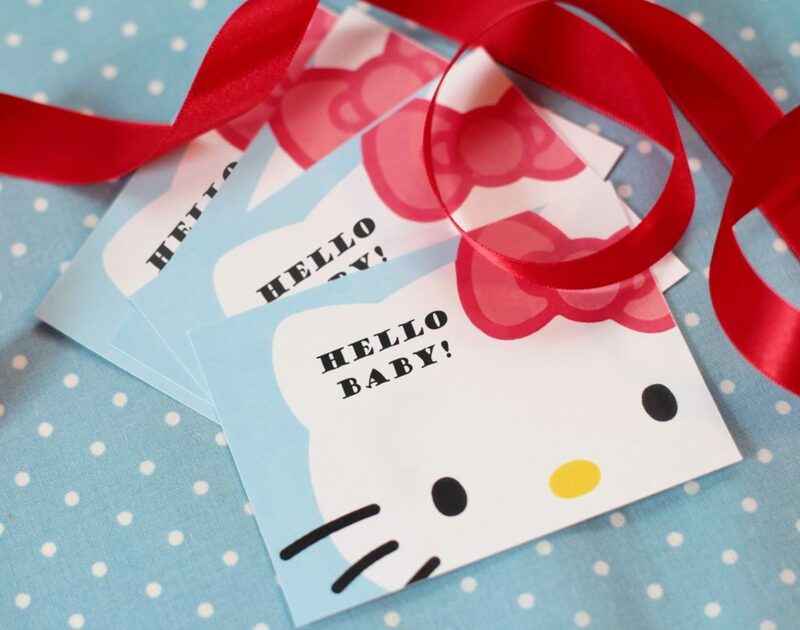 There are tons of Hello Kitty baby shower invitations available for purchase online. Some will mail finished invitations to you, while others will send you a personalized image file that you print at home or at a local printer. 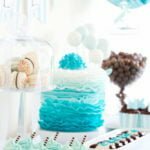 Now that you’ve mailed out your Hello Kitty baby shower invitations, your next step is to think about your decorations! Start by selecting a color scheme that goes along with your theme. Hello Kitty is a super chic feline, who looks great in just about any color, so picking colors for this theme is a piece of cake! We went with a red and baby blue scheme, but you can also do pink and yellow, or purple and white! Balloons, Streamers, & Banners – Balloons are always a cute and easy party decoration! Make sure you have lots of red or pink ones! 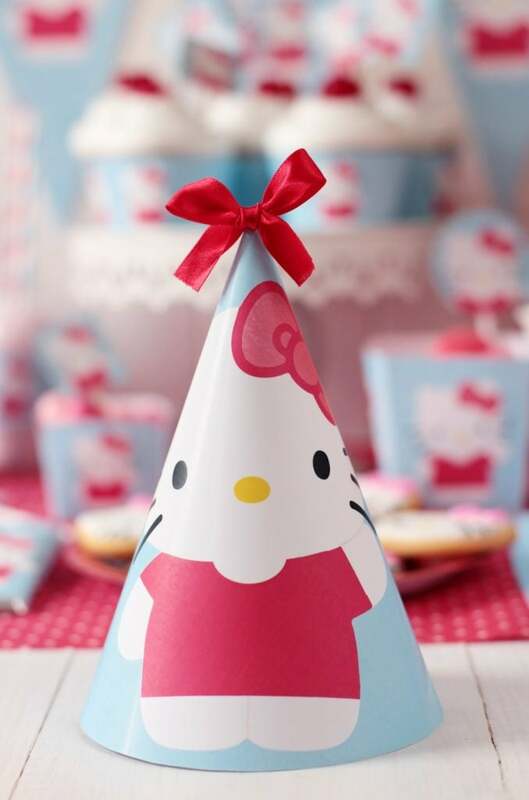 Hello Kitty Bow Cutouts – Use cutouts of Hello Kitty’s bow to decorate your gift table, food presentation, & party favors. Coordinated Cups, Plates, & Tableware – Complete your shower with a set of serviceware to match! Thanks to Postreadicción who provided these adorable, free printables! Strawberry allergies beware, because this baby shower menu is full of them! Why strawberries? 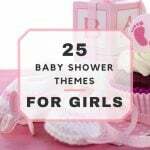 Because it’s the perfect pink palette for your Hello Kitty Baby Shower! 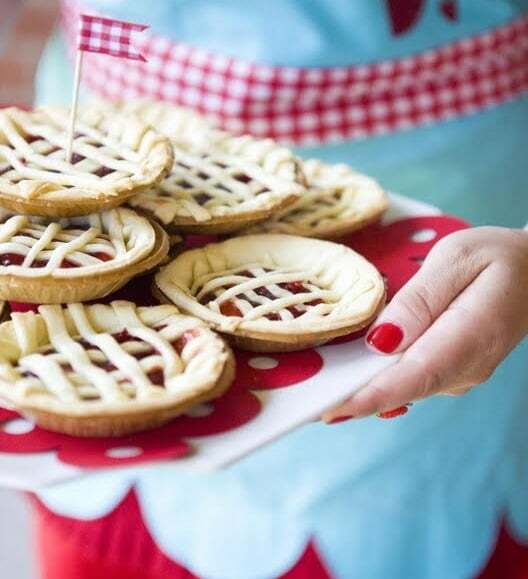 Miniature Strawberry Pies – Got this idea from Sara from Homespun Hostess! These adorable pies make the ideal bite-size treat for your dessert table, and don’t have to take a lot of effort to make! Check out this recipe for Mini Strawberry Rhubarb pies! Yum! Meow Mix – Skip the Puppy Chow, because Meow Mix is the sweet strawberry Chex mix you’ll want for your Hello Kitty Baby Shower! M&M’s and white chocolate? Yes please! Find the recipe here! Strawberry Milk & Cookies – Well if you’re going to serve cookies, you best remember the milk! 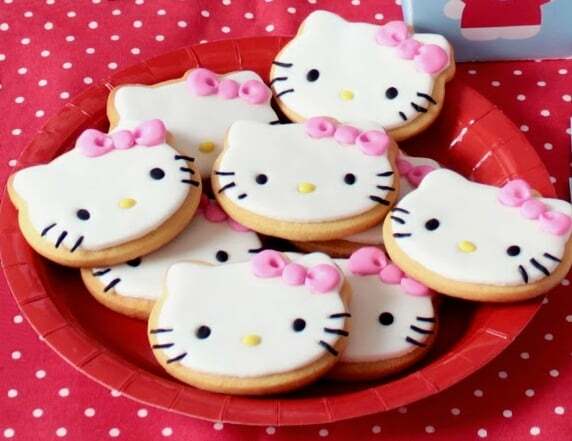 Pair some adorable Hello Kitty cookies with a mini milk jug of Strawberry Nesquik for a super cute snack! 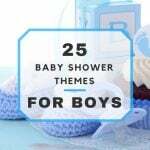 Every baby shower needs a few games to keep the party going! Purring Contest – Embarrassing? Yes! Hilarious? Yes! A game you’re going to want to include during your Hello Kitty Baby Shower? Absolutely! Your guest of honor is blindfolded and listens to each guest do their best ‘purr’ impression. After everyone’s gone, she picks her favorite as winner! ‘Bow’s the Word– This is a twist on the classic clothespin shower game. This time, guests are given a bow hairclip to wear. If they’re caught saying ‘Bow’, they lose their bow to the one who caught them! The one with the most at the end of the shower wins! Other words to try: “Baby”, “Kitty”, “Hello”, or mama-to-be’s name! Pin the Bow on Kitty – Create a giant white Kitty cutout using poster board. Draw her eyes, nose, and whiskers using markers. Then cut out a giant bow, in either pink or red poster board, whichever matches your color scheme better. 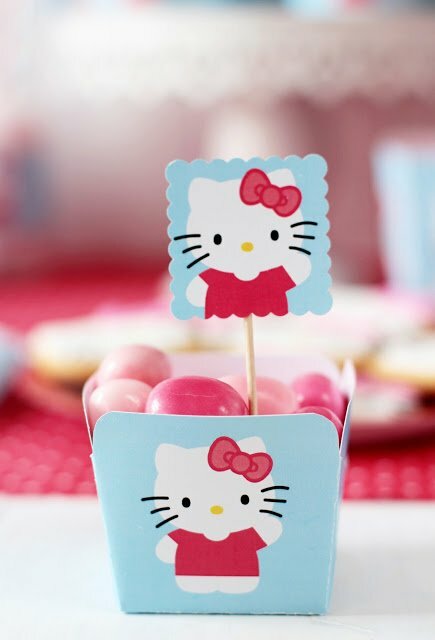 End your Hello Kitty Baby Shower on a sweet note with a variety of edible favor options! Candy Boxes – You can print and cut out these cute little boxes from Postreadicción and fill them with whatever type of candy your mama-to-be likes best! Kitty Cookies – You can serve these cute cookies at your shower, or wrap them up in favor bags tied with a little red bow and give them as favors! 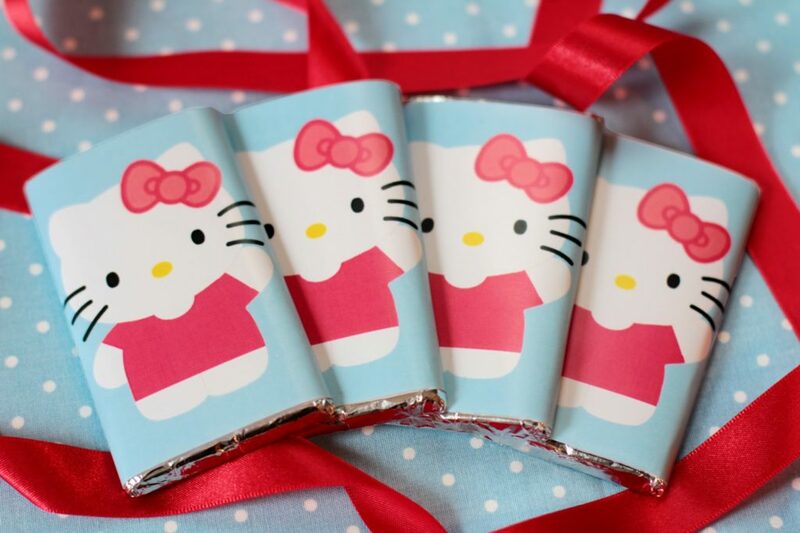 Chocolate Bars – Your typical chocolate bar gets a new look with a new paper sleeve featuring your favorite kitty! This is an inexpensive way to customize your favors!